In 1469 the Scottish Parliament, in an attempt to improve Local Government, passed an Act which in part decreed that Royal Burghs should form a Guildry from their existing Guilds of qualified Burgesses. These would then elect a Committee of 14, who in turn would choose a Dean of Guild. At this time, as a Member of the Court of Four Burghs, ie Lanark; Linlithgow; Stirling & Edinburgh, Lanark controlled and checked the making and issuing of all Scotland’s standard weights, authenticated by stamping with the Lanark Eagle. This was supervised by the Dean of Guild. Other duties included acting in both Judicial and Ministerial capacities; as a Justice of the Peace in the County under the Commission from the Sovereign and as a Trustee under various Road Acts and Private Trusts, in both the Burgh and County in which the “Dean of Guild” for “Time Being” was named. 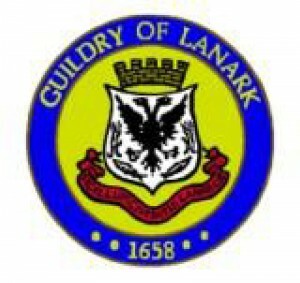 Through the years many changes in Local Government have occurred which have diminished the role and influence of the Guildry and today Lanark Guildry’s interests are mainly in acknowledging and promoting the historical traditions of the Royal Burgh of Lanark, such as Lanimers week, and Remembrance day. The Guildry still works for the benefit of the town through membership of various committees and organisations and by donations to the local schools and by providing and presenting a prize each year to the top apprentice at nearby Motherwell College.